Your collaboration is beautiful...wonderful water shots!!! 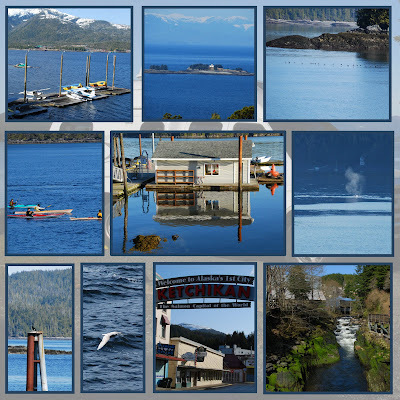 Having spent some time in Ketchikan recently myself, I enjoyed the pictures. Nicely done--both of you. Mmmmm, mmmm, mmm!!! Alaska is one state I've never visited and would love to go there someday. What a wonderful share storyteller!!!!! Lucky you to have a wonderful sister who is willing to share her beautiful travel photos. Your collage of her is fantastic way to view them, well done. A very nice collage. Says Summer. Such a beautiful place. Great photos and collage! Nice outdoor post. What beautiful pictures and collages. Thank you for your advice on blogger. I am certainly going to try that.I thought that after I send them from picasa that's that for that time and you have to start all over again. Stunning, it makes me want to move only soon the snow comes and then I would to get out! The little house in the middle beckons, but all are delightful water shots. The lush green on bottom right is wonderful. Wonderful mosaic! Happy Outdoor Wednesday! She got some great photos, they brought back memories. We, too, have a class "B" camper, a little smaller than theirs. They're great "go anywhere" campers. I love the blue shots, but that's because I host blue Monday. Gosh, there are just so many beautiful places. These photos show just that. Traveling in a RV like this can be so much fun. So nice that they are giving this gift to themselves. Many beauiful, watery shots. Beautiful blues! Beautiful pictures, ST... I haven't been to Alaska YET---but hope to go sometime. My oldest son used to work up there--and he sent us a bunch of pictures of Ketchikan when he was there. GORGEOUS area!!!! Everyone HAS TO CLICK ON THIS COLLAGE! I had to go through them one by one to take in that scenery! 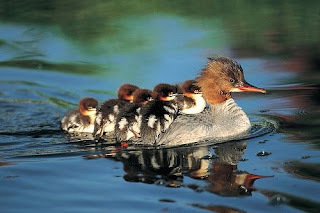 That shot of the Merganzer with her babies on her back brings back memories. I saw one on our creek earlier this spring with 6 riding along. What a wonderful and surprising experience! Lovely photos. I would love to travel, but hope my RV could be a little bigger! This blue feels so relaxing - I want to dip my feet in it! Are these waters really this blue? Absolutely stunning! Looks like this was an excellent adventure. Thanks for visiting my site. Your collage is lovely. Very watery! I had to laugh when I read your 'Thought For Today'. These are nice pictures (and 'bluer' than the other one with Molly. 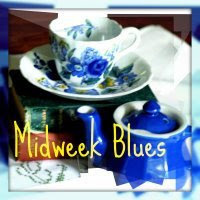 Happy MidWeek, keep up the good work. This picture brings memories, I've been in all 50 of the states. You and your sister collaborate very nicely. The pictures are wonderful, and you've put them into a beautiful collage. Fabulous photos. I love the second grouping of photos. The blues are so beautiful! OMG! I did click to enlarge and the photos are so beautiful! Make me wish to go and take a vacation, in that RV! what cab I say but wow.. love your site.. I want to be retired! Your collages and the photos you used to assemble them are beautiful. Your entire site is lovely. I hope you are having a wonderful day. p.s. thanks for stopping by my necessary room. always a pleasure. We've had a heat wave for the past week so we've had the worst of summer but very little of the good parts of it.